Agency, 30 January : Theresa May is expected to continue talks with EU leaders in the coming days after MPs backed a proposal for her to renegotiate her Brexit deal. MPs voted 317 to 301 in favour of replacing the backstop – the insurance policy designed to avoid a hard border in Ireland in the event of no deal. But the EU has said it will not change the legal text agreed with the UK PM. Mrs May is also set for talks with Labour leader Jeremy Corbyn after MPs backed an amendment rejecting no deal. 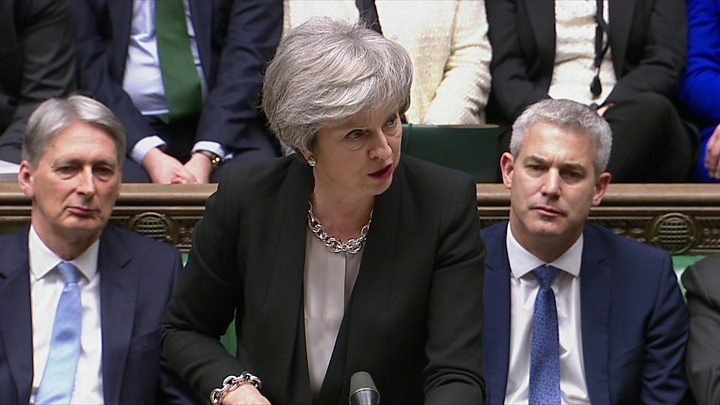 The prime minister said that, after taking the votes into account and talking to the EU, her revised deal would be brought back to the Commons “as soon as possible” for a second “meaningful vote”. French President Emmanuel Macron also said the agreement was “not renegotiable”, while Irish Foreign Minister Simon Coveney said the backstop arrangement remained “necessary” despite the vote. Mr Tusk added the EU would, however, be willing to look at the political declaration again – the part of the deal that makes a pledge on the future relationship between the UK and the EU – and that the EU would “stand ready” to consider any “reasoned request” for an extension to the leave date of 29 March. An amendment rejecting a no-deal Brexit also won the support of Parliament on Tuesday – but the vote was not binding, meaning the date for exit remains 29 March.